Home » BROOKMAN, JOHN U.
JOHN ULMORE BROOKMAN, shipping merchant, was born in Bucksport, Maine, Nov. 25, 1830. His father, a Prussian by birth, settled in America about 1800. His mother came from an old colonial family. His education was finished at Wesleyan Seminary in Kent’s Hill, Maine. At the age of sixteen, he began life as a clerk for his brother Henry, commission and ship chandlery merchant. In 1851, John was admitted to partnership in H. D. Brookman & Co., the style being changed in 1856 to H. D. & John U. Brookman. The brothers worked hard, gradually gained large interests in vessels and derived large profits, both from their store and in freighting cargoes between the continents of the world. In 1864, the firm dissolved, selling their vessels as rapidly as possible. Since then, Mr. Brookman has transferred his interests mainly to railroads and real estate. He is a capable, clear headed and successful man. At one time, he served in the directorates of the Evansville & Terra Haute, The Chicago & Eastern Illinois, The Louisville & Nashville and the Northern Pacific Railroads, but retired therefrom when he sold his stock. At present, he operates mainly in real estate and is aiding in the development of Tacoma, Washington. His wife, whom he married in 1856, is Sarah, daughter of Colonel Rowland Carlton of Sedgwick, Maine. 1890, Washington and Alaska. 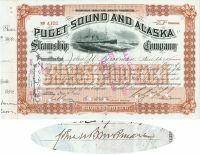 Stock certificate for 50 shares of the the Puget Sound and Alaska Steamship Company. Brown/Black. Lovely engraved vignette of a steamship in rough seas at top center. Printed by Franklin Bank Note Company. Issued to and signed on verso by John U. Brookman. Punch and stamp cancelled and Excellent.